The most famous John Harvey in Detroit's history was the baker who failed to tend his ovens in 1805. As a result, a fire from his establishment consumed the entire city, leading Father Gabriel Richard to utter the phrase, Speramus meliora, resurget cinibus, in June of that year. Two hundred and four years later, Father Richard's words continue to be the official motto of a city of Detroit. A fitting motto, in my view, reminding us of the city's strong European and Roman roots. The John Harvey who built the Second Empire home you see when you look west from the upper deck of the new Comerica Park, was born in Glasgow, Scotland and was brought to Detroit as an infant by his parents. Eventually he inherited his father's foundry, Andrew Harvey and Sons. Detroit, by 1890, became the nation's leader in the development and production of pharmaceutical drugs. As an adult, John Harvey, became the entrepreneur of his own drug firm. As you might guess, the Scotsman John Harvey was a Presbyterian. With his great prosperity, he had the res ources to help the city's poor, so he developed a reputation as a philanthropist. In the 19th century there were no federal programs to help widows and their orphans, nor were employers required to provide health insurance or death benefits. Because of the high death rate of adult men due in part to many industrial accidents, many women found themselves at the verge of poverty and many children were orphans. John Harvey founded the Mission School of the Detroit Industrial School for orphaned children, including some who were orphans because of the deaths of their fathers in the Civil War. For 38 years, John Harvey superintended this school. John Harvey had this Second Empire-style home built for himself and his family. The Second Empire refers to an architecture style popular in France from about 1852 to the 1870s when Emperor Napoleon III ruled that nation. It is an eclectic style that capitalized upon earlier architectural styles and achievements. It is marked by high roofs and lush ornamentations that led French architecture to great popularity in this nation. The Second Empire style also incorporated the use of lucarnes. These are segmented or semi-circular windows designed to admit light to the topmost story of a residence. Notice the several porches around this beautiful warm red brick home along with the many towers that seem to guard the corners of this house. This is a large 11,000 square foot residence. When built, there were guard rails so that residents could walk around the top of the turrents. Detroit's broad boulevards, leafy upscale neighborhoods and many elegant homes in the late Nineteenth Century led to giving the city the sobriquet "Paris of the West". 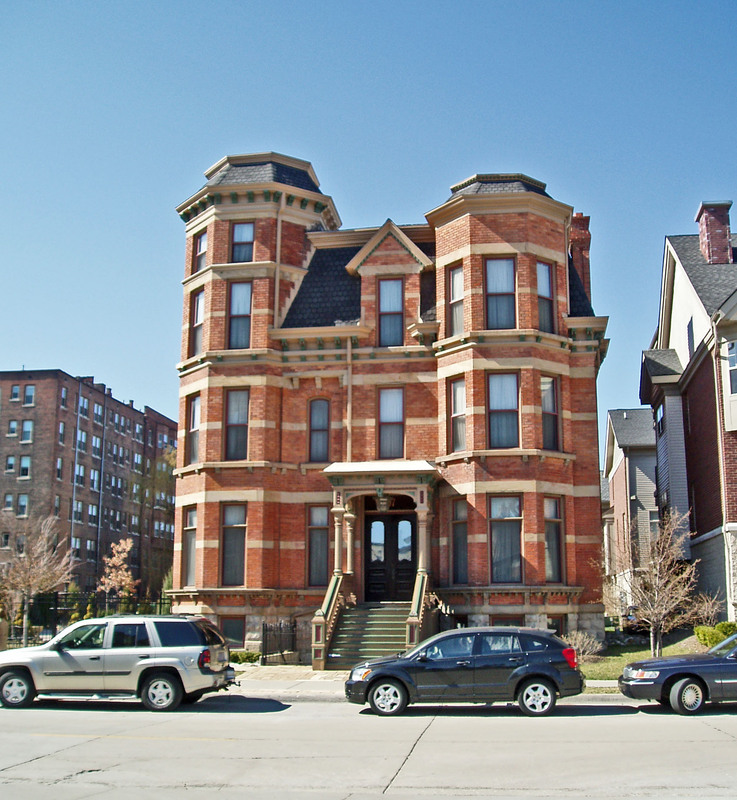 The many Second Empire-style homes in Brush Park led to this area being called "Little Paris." John Harvey lived in this home until 1905 and his widow resided here for another 15 or 20 years. Tastes and economic conditions changed, so the demand for homes such as this one plummeted during the Depression. Similar to homes in many of Detroit's elegant neighborhoods, the Harvey home was converted into a rooming house in 1938. Presumably, it provided rooms for many workers during World War II, but thereafter, Brush Park went into decline. Early in the Twenty-first Century, Ghassan Vazbeck and Marily Nash-Vazbeck purchased this property, refurbished it to the standards of the Harvey's and converted it into an inn. For me, baseball connects the past and the future. In Michigan, it is a great delight to watch the Tigers in the warm sunshine. 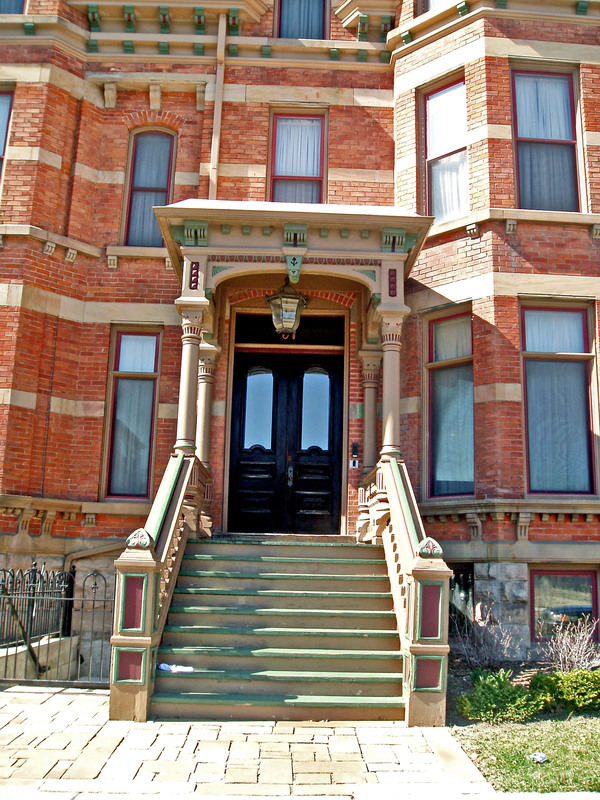 I have often found it relaxing and informative to walk out of the new Comerica Park and into Brush Park where beautiful homes from the far distant past may be seen both in their immense glory and in their need for revival. I wonder, sometimes, if there is any city in the USA where you can go to a baseball game in the afternoon and then walk for 45 minutes or so and see so many architecturally significant homes, churches and buildings? It would be marvelous to come into Detroit in the afternoon, spend a couple of hours taking pictures, then watch the Tigers play in the evening before spending the night at this inn. If the Tigers were home the next afternoon, you could spend the morning taking pictures in downtown Detroit and then see an interesting baseball game. National Register of Historic Sites # 91000354; Listed April 5, 1991.